Interested in learning more about historical structures, places, or artifacts in Sudbury or another Massachusetts town? A largely unknown yet important historical resource is available online. 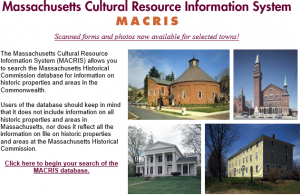 The Massachusetts Cultural Resource Information System (MACRIS) allows access to the Massachusetts Historical Commission (MHC) database for information on historic structures, areas, and objects in the Commonwealth. MACRIS data are compiled from records maintained by the MHC which include such sources as the Inventory of Historic Assets of the Commonwealth, National Register of Historic Places nominations, State Register of Historic Places listings, and local historic district study reports. For example, the MACRIS historical narrative about the Goodnow, Asher House and Farm at 174 Boston Post Road in Sudbury reveals that the house was built at a time when life along the Boston Post Road was expanding with commercial and industrial centers at Wayland Center and Mill Village/South Sudbury. This property was first the home of Asher and Fanny Sanger Goodnow and later of their daughter, Fanny, and son-in-law, Timothy Johnson (1800-1864). Another interesting entry describes the Goodnow Watering Trough which was donated to the town in 1891 by John B. Goodnow (1830-1904) who lived across the street at 365 Boston Post Road and also owned the building which once housed Kidder’s Shoe Shop. Goodnow suggested that the watering trough be located at the end of Concord Road to delay travelers who would stop at the general store located there. New information is added to the MACRIS database daily, and information from MACRIS used by this search system is updated weekly. The MACRIS website can be accessed either from the Town of Sudbury website at https://sudbury.ma.us/historicalcommission or directly at http://mhc-macris.net. Information on how to use the database can be obtained here. Records in MHC files and, therefore, in the MACRIS database include inventoried areas and designated districts for which complete listings of the street addresses of included properties are not presently available. The absence of a record for a specific street address is no indicator of whether or not a property is included in an area or district on file with the MHC. Street addresses reflect those used at the time information was submitted to the MHC and may not reflect subsequent street re-numbering. Users seeking specific location-related information should consult directly the records, files, and maps available in MHC’s public research area at its offices at the State Archives Building, 220 Morrissey Boulevard, Boston, open M-F, 9-5. This search system includes only information derived from MHC files. The database does not include information on all historic resources in Massachusetts, nor does it reflect all the information on file on such resources at the MHC. Many additional Massachusetts historic properties exist, for which information is not presently on file in the MHC records used to compile the MACRIS database. The next time you’re wondering about the history or origins of a state building or object, try the MACRIS database where you will find a wealth of interesting information.